This 1971 Turkish film is incredible. Tarkan is a string bean with a little moustache, the Vikings all wear pastel-colored bath rugs for furs, and there is even a real, live inflatable octopus. In realm of kitsch entertainment, "Tarkan vs. the Vikings" rivals the very best Luchador films. Long time fave, great bad movie! I promise I'm not Toro! Great Review though looks fun to watch. He does not look like a Viking king to me. He looks like the mascot for a brand of toilet paper. Wiped out by Tarkan. Viking (to Lotus): "Where is she?" Tarkan: "Leave that woman alone!" Viking: "Tell me where she is!" I am familiar with many of the Tarzan films, seeing many of them both in the theater and on TV, but when I thought I saw "Tarzan vs. the Vikings," which I had never heard of, I said to myself: "That title looks interesting. It looks like something I might want to see." Then I took another look at the title. Never mind. Carry on. I also thought the title was Tarzan Versus The Vikings ~ I re-read the title and then went for an eye test last Friday. Well with the Silk & Spice trade it isn't out of the question for Chinese to make it to Turkey. That octopus has eight arms and it doesn't know how to operate a single one of them. After reading your great review of this film and watching that great clip, I MUST SEE THIS MOVIE! I actually checked on Amazon.com and the used price of the double feature DVD this is a part of is 15 dollars but it is also going for 44.99 brand new which is outrageous. I'm going to check ebay as well. 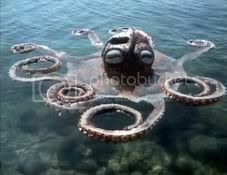 As a devotee of cinematic cephalopoda, I can state that this octopus is the worst! Always looking for bloopers/flubs/nits in films. And I think I saw one in "Tarkan vs. the Vikings." In his bar brawl with the Vikings, did Tarkan, after using his sword on the Vikings, return his sword to its scabbard, without wiping it off first? If so, bad Tarkan bad. No good soldier would return his sword to its scabbard without wiping it off first, because, the next time you tried to draw your sword, it might stick because of the congealed blood on it. "Hey Disney! You know the first version of 20,000 Leagues Under the Sea's squid attack? The one with the pretty pink sunset? The one you ordered us to destroy? Well, someone took our squid out of the trash, ya see, and...well..."
P.S. Any plans to review the first Tarkan movie? Small details: This movie "based on" the 400s years, which means, there was no any Turkic domminance today's Turkey. Turks had the political power in Anatolia after 1071. Turkic tribed were mostly located in Thrace, Eastern Europe, Northern Caspian-Black Sea and Central Asia. And they were the neigbours of Finnic peoples as well. And Huns were a kind of multi-cultural empiredom which had Germanic, Turkic, Mongolic, Hungarian and Slavic fighters. And the word "Turk" was not exsisted during that era, the term Turk occoured one century after this by Göktürks (which means Celestial Turks or Blue Turks).